Supergirl reaches a turning point in the ongoing struggle against Agent Liberty as the mystery behind Nia is answered. This show hasn’t always done the best job connecting the various ongoing plots. Fortunately the same can’t be said about this season so far. Manchester Black’s quest for vengeance is intimately tied to the ongoing Agent Liberty story in ways this particular episode makes good use of. I mentioned last week that the writers are taking a hard-line stance against his methods because the ethical framework of the show needs to have Kara be right when it comes to her morality. I think that this is misguided and unnecessary because it belies the complexity that could exist in having her point of view challenged. It’s also clear that Manchester Black’s methods have achieved results much quicker than Kara, Alex or anyone else so that also makes for a debate worth having. This episode is a great example of Manchester Black being ahead of everyone else in his investigation as he is already aware of Agent Liberty’s true identity and is confronting Ben about it where Kara is still chasing leads trying to find out who he is. Of course Kara should never sink to Manchester’s level but I still believe the writers could be playing up the moral conflict in more interesting ways than simply having Kara be one step behind him because she’s unwilling to cross the lines she has personally drawn. J’Onn acting as the angel on Manchester’s shoulder both works and doesn’t. The trouble with this is that we’re supposed to accept that they were both close to Fiona which forms the basis of J’Onn’s concern for Manchester’s soul but J’Onn’s friendship with Fiona was developed off screen with only one episode actually showing it so it becomes an example of being told how something is rather than being shown. The implication is that J’Onn is forced to cross the line in order to stop him but it doesn’t come across as well as it needs to and the psychic interventions feel very repetitive the more they happen though I was pleased that this wasn’t used to allow Kara to find out the identity of Agent Liberty. Even though she’s one step behind him she still manages to learn on her own. The scene where J’Onn visits Manchester in prison to announce that he hasn’t given up on saving his soul yet comes across as J’Onn being weirdly obsessed with the morality of someone he barely knows rather than the declaration of one friend refusing to give up on another. Manchester’s scenes with Ben are really tense stuff. The episode makes Ben’s perspective the viewer’s perspective in order to make Manchester seem more intimidating when combined with the knowledge that Manchester knows his secret. Their conversations basically embody the Tarantino style of being fairly mundane while the audience knows that there is something more to it. I’m not saying this episode is as good as the likes of Pulp Fiction but these scenes do a decent job building that tension between Manchester and Ben as they both know what the real situation is while Ben’s wife carries on unaware of how much danger she’s in. 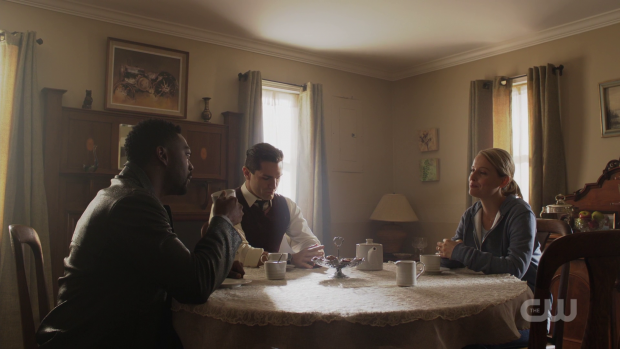 As always Manchester’s motivations don’t quite work but David Ajala’s performance remains as engaging as ever and when paired with Sam Witwer the scenes are endlessly watchable. For a good chunk of the episode it’s little more than two talented actors playing against one another. The details of the conversation aren’t all that interesting but they aren’t supposed to be as the important thing is the tense atmosphere created through the true meaning of the conversation. Ben tries to maintain his composure while Manchester looks to intimidate him and make it clear what he’s capable of. The most important thing said is the foreshadowing associated with the anecdote about Bunker Hill seeming like a victory at first but being more of a defeat in hindsight, This is almost exactly what happens when Ben is exposed as Agent Liberty and arrested for his crimes. It seems like a victory on the surface but as he is being hauled away he quickly becomes a martyr for his cause with his public arrest acting as a platform to cast suspicion on Supergirl and frame his arrest as a human rights violation. It’s pretty much the validation his cause needs as people see him as the one who dares to speak out and now he’s being silenced. His wife is shown to be in complete agreement with him and leads a chant that riles up the crowd. Ben’s arrest will likely end up making the situation worse in the long run as people see him as a heroic victim. His attempt to cast suspicion on Supergirl works almost immediately. 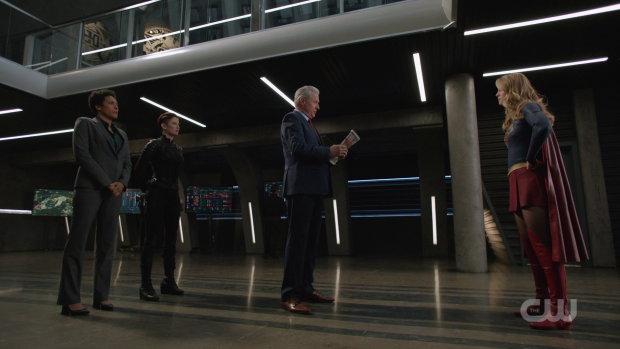 President Baker (Bruce Boxleitner) reacts to this by deciding that the DEO needs to be a fully transparent organisation which means not having superhero with a secret identity among their ranks. He asks Kara to give up her secret identity which she refuses to do because those she cares about will be put in danger of she does that. President Baker points out that his family are being protected by the Secret Service which isn’t as profound a point as it is clearly meant to be as that same protection isn’t offered to Kara’s family should she choose too -figuratively speaking- unmask. I also wonder how President Baker reached the conclusion that Supergirl even has a secret identity. Surely she could get away with saying that her name is Kara Zor’El and that’s who she is all the time. It’s also worth pointing out that the United States Government has operatives it keeps secret elsewhere so why shouldn’t that apply to Supergirl? Of course it isn’t difficult to figure out who she really is just by exploring the overlap between those that interact with Kara Danvers and Supergirl on a regular basis. Her refusal changes things somewhat as she can no longer work with the DEO. Kara leaves willingly with an amicable end to her association. The parting words about the United States not wanting a War with Supergirl are so brilliantly delivered and conveys the current relationship the DEO has with Kara perfectly. There also exists the disturbing implication that President Baker doesn’t see aliens as people but will treat them as such because his role as President demands it. I predict it won’t be long before he shows his true colours though I am impressed by it bubbling beneath the surface rather than being overtly declared. I’d be interested to see how this changes things within the show. Will Alex have to treat her with hostility now that Kara no longer works with the DEO? There will certainly be overlap in the missions that are being worked on and I expect that Alex will still feed Kara relevant information on the sly. By ending that association both parties are worse off which means that Ben’s cause has accomplished something worthwhile despite his arrest. This is a good way to wrap up a specific plotline in what amounts to the midseason finale of Supergirl (crossover not included) while establishing that the story isn’t over and that there will be consequences to what happened in this episode. Nia’s narcolepsy receives plenty of attention in this episode. Brainy reveals that he knows of her in the future but refrained from saying anything because he doesn’t want to disrupt the time continuum even though his very presence is arguably doing that unless he knows that he was supposed to be there. In any case, his desire to help her master her powers also constitutes a risk to the continuity of the timeline though the show only seems interested in exploring that idea on a very basic level. There is a significant exposition dump about Nia being an alien with a rare genetic trait that allows her to see the future through her dreams. A recurring nightmare that she has forms the basis for Kara’s investigation that leads her to Agent Liberty by the end. None of this is bad as such but it does feel like a retcon of Nia’s character who only recently admitted that she’s transgender only to also be an alien. On one hand it’s great that the show isn’t focusing on the fact that she’s transgender but this new reveal brings up so many questions such as how long she has been on Earth, where her family currently are and where was she born? All of this demanded attention but the script rushes past this in favour of giving her a super powered tutorial. She goes from being terrified of her power because she doesn’t understand it to being able to activate it almost at will and dodge a bullet all in the space of a single episode. There is a half baked excuse about powers being akin to muscles growing stronger the more they are used. This sort of development should take more than a few hours considering how significant a step forward it is. I also find it problematic that Kara continues to keep her secret from Nia considering how open she is with her and how that would be the perfect way to build trust as well as establish Kara as a credible mentor. Despite the problems, Nicole Maines is still excellent as Nia. She continues to blend perfectly with the cast and adding her to the more action driven story rather than having her as a background presence at CatCo is definitely advantageous for the episode. Nia and Brainy make for a particularly engaging pair who bounce off each other wonderfully and Kara is a great addition to that mix as the experienced voice who keeps them on track when they might otherwise be driven to distraction. The end of the episode teases the crossover brilliantly. A caption declares the setting of Earth-90 -so much for there only being 53 including Earth-X- with the camera panning over the aftermath of a battle with several dead superheroes; some of which will be familiar. 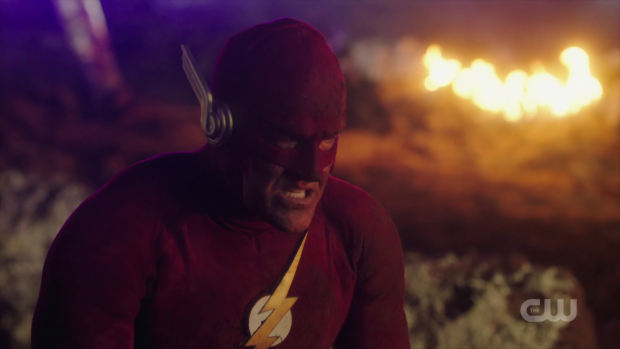 The 90s version of the Flash played by John Wesley Shipp is shown crawling towards a man with a magic book stating that he failed before opening it. As someone who has been looking forward to this crossover since before it was announced this sets the stage perfectly for something that will hopefully be suitably epic with plenty of fan service. I’m just hopeful that the story will do it justice as well and deliver something worthy of the excellence that was “Crisis on Earth-X“. A strong episode that moves the plot along, ends on a bittersweet note and makes good use of many of the characters. Manchester Black’s quest for vengeance is a mixed bag with his motivations not quite working but the execution of what he does to find those responsible for Fiona’s death working really well. The scenes he shares with Ben are brilliantly tense stuff that take notes from the Tarantino school of building tension by using the audience knowledge of what the mundane conversation is really about to build the tension. The foreshadowing of Bunker Hill as an important metaphor for what the victory achieved in this episode actually means is the only important takeaway in terms of what is said during the conversation with the real meat of it lying in what wasn’t said. Ben being arrested along with Manchester solves the problem of them not being on the loose but will clearly create problems down the line. Ben becomes a martyr for his cause and uses his arrest as a platform to turn suspicion on Supergirl while calling the arrest a “human rights violation”. 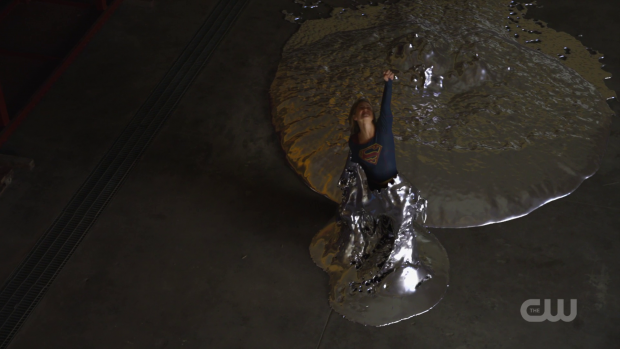 It’s enough for the DEO’s connection to Supergirl to be severed when she refuses to reveal her secret identity to them which naturally weakens both parties. Nia’s narcolepsy is interesting enough on paper but feels rushed in its exploration in this episode. It’s good that no attention is being drawn to her being transgender but the reveal that she’s an alien with a particular genetic trait raises more questions than the episode has the time or the inclination to bother answering. She also goes from being clueless as to how her power works to being competent in its use in the space of a single episode. 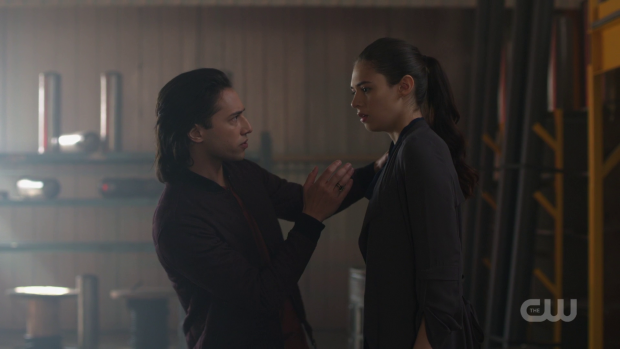 Nicole Maines is still great in the role which saves it to some degree and her interactions with Brainy are relentlessly charming but it feels rushed and it’s unclear why Kara continues to hide her identity from Nia considering the opportunity to build trust and establish herself as a credible mentor. The tease for the crossover that ends the episode is brilliantly enigmatic and full of fan service. My excitement levels are very high for this and it shall be covered in its entirety next week.